Loppy the Lac (Little Anxious Creature) has learned how to watch out for all of life’s potential dangers and pitfalls. He is always alert, keeping an eye out for something, anything, that could go wrong. Curly Calmster has learned how to be calm and soothing and how to say encouraging things like ‘I can do it’ and ‘I might try it’. When Loppy meets Curly he panics. His heart beats fast and his arms and legs feel stiff. There are so many things that could go wrong, Loppy doesn’t know which one to worry about first. Fortunately Curly is there to remind Loppy to breathe deeply and be calm. Created as a resource for counsellors, teachers and parents working with children with anxiety issues, Lessons of a LAC is a wonderful story to have on hand at home as well. The story reminds children that just because something might go wrong, doesn’t mean that it will go wrong. It is important to breathe deeply, think clearly and stay calm to make sure the best decisions are made. The message of the book is obvious as Curly soothes the anxious Loppy, but the story still holds appeal as an everyday picture book thanks largely to the illustrations by emerging illustrator and artist Kirrili Lonergan. The limited colour palette and the long looping red and white striped pattern curling across many of the pages gave the illustrations a very Seuss-ish feel for me as I read the story, which helped to balance the more serious central theme. Author Lynn Jenkins is a registered clinical psychologist with a particular interest in helping children and adults deal with anxiety and depression. She is passionate about early intervention and believes that it is important for children to develop coping skills from a young age. Many years ago my daughter went through a brief period of anxiety and I wish I had Lessons of a Lac to help explain what was happening in a way that she could understand. 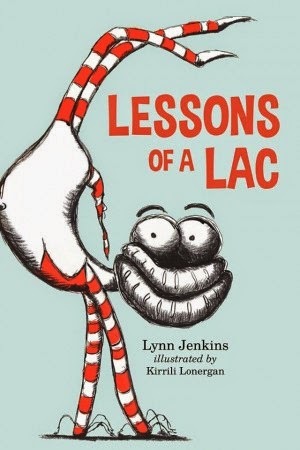 Lessons of a Lac is a wonderful book to have on hand in a preschool or infants classroom or simply on the bookshelf at home. Reading about Loppy and Curly gives children the opportunity to learn important skills for dealing with their worries as well as offering parents and teachers an opportunity to start conversations about positive ways to deal with anxious feelings.